100 musicians performed ‘The Violin’ – a work inspired by WW1 Private Burchell and his Violin. His family will never forget hearing the violin again. 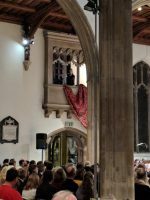 100 musicians from five Chelmsford schools performed ‘The Violin’ – a work inspired by a First World War Soldier, Private Burchell, and his Violin. Private Burchell’s family will never forget hearing the Violin again. Private Burchell’s grandson, Alan, and granddaughter Adele and other family members travelled from Cornwall to hear the concert. 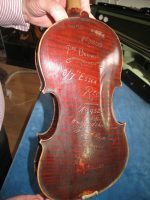 Alan said “This cherished violin not only came home from the trenches as a soldier’s memento, but also survived World War Two when my grandfather lost not one, but two, homes during the Blitz. 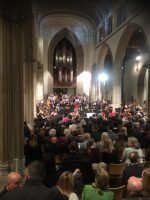 The Violin was created and performed by the young musicians with composer John K Miles in a concert on Wednesday 7 November in Chelmsford’s Cathedral. The * five schools formed an orchestra and choir and performed with City of London Sinfonia, a leading chamber orchestra, directed by Miles. The now restored soldiers’ violin was performed throughout the world premiere of this original work by young violinist Iris Heij from Boswell School. 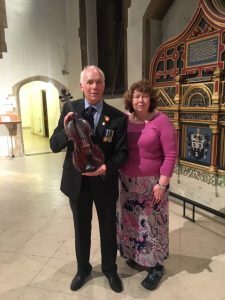 Private Burchell’s son David and his daughter-in-law Jo are now both in their late 80s and they have their own memories of Albert playing this violin when they were engaged in the early 1950s. The concert also included poetry readings by students who entered the Chelmsford Festival of Ideas Peace Poetry Competition. Young students also introduced the music by the CLS of works written by wartime composers including Holst, Ravel, Vaughan Williams and George Butterworth. The retiring collection in aid of the Royal Anglian Regiment Benevolent Charity, raised a significant amount of money. The concert is one of a number of events taking place across Chelmsford to mark the centenary of the end of the First World War and to remember all those who made sacrifices. For further information, please visit www.visitchelmsford.co.uk/armistice2018.